Written by Allison Perry. DM by Tawnie Kozora. A $6 tip. Image by www.dailyherald.com. Did you know restaurant servers are not paid minimum wage? That’s right! 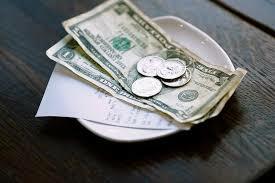 Because servers are intended to be tipped by patrons, they make less than the minimum wage. In Illinois, restaurant servers are only paid $4.95 per hour. The most unfortunate problem that goes along with the wage servers are paid is patrons do not know how to tip. 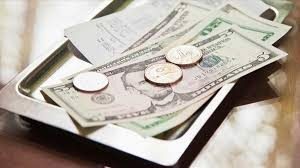 Some do not tip enough because they are genuinely unaware of the small amount servers are paid, others do not tip enough simply out of rudeness, but many do not tip enough because they are unaware of the proper percentage to tip. While proper percentages may vary across the country, the most common are 15%, 17%, and 20%. These percentages are based on different levels of the service experienced. A tip of 15% suggests the service was below average. Tipping 17% suggests the service was average. 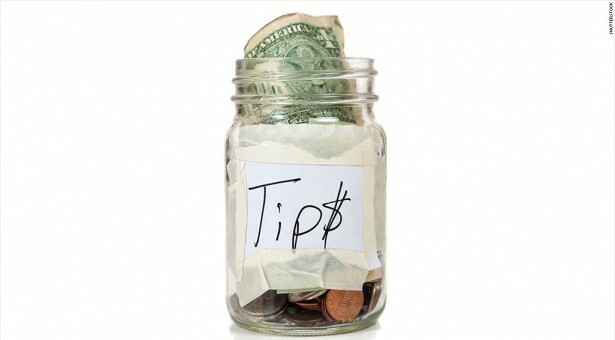 If service was above average, the proper tip is 20%. A tip above 20% suggests the service was outstanding. A receipt for a meal. Image by www.buzzfeed.com. 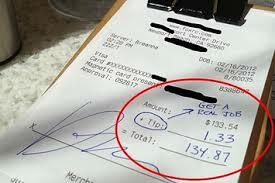 It may be confusing to some, why a tip should be given even if the service was below average. Well, first of all, not leaving a tip is simply rude. Second of all, there could be a number of factors causing the service to not be top notch, many of which have nothing to do with the server. The restaurant could be very busy, which means your server is serving many different tables, not just yours, and that means your server is taking orders, giving refills, serving food and trying to please multiple people at once. A restaurant being busy also means that in the kitchen the cooks have tickets upon tickets of food to cook, so if your food is not out within twenty minutes of the time you ordered it, that’s because you’re not the only person in the restaurant. Something else to remember about eating in a restaurant is that there is a lot more happening than what can be seen in the dining room. Perhaps the team is short a server because someone called in sick, or a cook quit on the spot leaving the team to pick up the pieces. There is so much that goes on behind the scenes at restaurants, and being inconsiderate of that is incredibly problematic. Lastly, maybe you think your server isn’t sweet as apple pie and simply doesn’t deserve a tip. Wrong. Working in a restaurant is stressful, and so is life, so perhaps your server is having a bad day. Instead of being rude, be encouraging. Leaving anything less than 15% is simply unacceptable. It’s important to tip your server because that’s where most of a server’s income comes from. Once taxes are taken out of a check, servers may as well not be working at all. Servers have homes, children, bills, loans, groceries, pets and lives that require providing for. When you go to a restaurant, you must view your server as a human being with life struggles who is working hard to make money. If you can’t tip your server, don’t go out to eat.